Though a very prominent figure for almost a decade in mid-19th century Leicester and more widely in English nonconformism, Barker is very difficult to trace in the usual official records as he used none of his actual names in his adult life. He was born in Hull in 1831, the son of Thomas Christopher Johnson who had “married” Ann Elizabeth Barker at St.Mary’s, Beverley, in 1830. However, Johnson was already legally married at the time so the union was bigamous. Johnson Barker was baptised into the Church of England at Holy Trinity, Hull, with the given names of Thomas William. The records of the Fakenham Preparatory Academy, Norfolk, often referred to as Fakenham Congregationalist Seminary show that Johnson Barker was a student there from 1850-52 under that name, so he had adopted his adopted his mother’s surname of Barker and his natural father’s surname as his forename. By the time of the 1851 Census he was recorded as a student, aged 19, born in Hull, living in the house of William Marshall, a lawyer, at 59 Cottingham Place, Hull. As he went on to study law at university it may well be that he was a private pupil of Marshall, preparing for university entrance while still at the Fakenham Academy. From 1852 to 1858 he was a student of New College, Hampstead, London, which had been formed in 1850 by a merger of three established seminaries of Congregationalist, Unitarian and Presbyterian traditions. According to the Charles Surman card index of Congregational Ministers, now housed in the Dr. Williams Library, London, Johnson Barker gained the London University degrees of BA in 1854 and LLB in 1855. However, the confusion and ambiguity about the names he used seems to have continued well into adulthood. The published summary register University of London Graduates 1836 – 1926 has no entries at all for a Johnson Barker, and his 1854 BA seems to have been awarded under the name William Johnson. Though he styled himself “LLB” and a London University LlB degree is recorded in the Surman Index, there must be some doubt about this since none of the possible permutations of his names appear against any 1855 London University Bachelor of Laws degree. 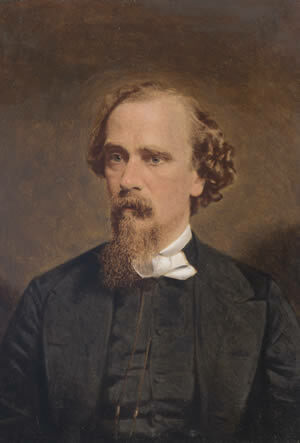 He left New College London in 1858 to take up (under the name Johnson Barker) the position of Minister to the leading Congregationalist church in Leicester, the Bond Street Chapel. During his nine years there he greatly expanded support for the Chapel and the original 1821 building was substantially re-modelled and extended creating a total seated capacity of 1160. In the 1866 Yearbook of the Chapel he wrote an historical account of the church. At the end of 1867 he left Leicester to return to London to become the Minister of New College Chapel and serving there for 21 years from 1868 to 1889. (He was succeeded at Bond Street Chapel by Rev. Robert Harley FRS, Lit. and Phil. President for 1870-71.) In 1890 Barker re-joined the Church of England into which he had originally been baptised, and was ordained Deacon and then Priest in the same year. He served as a curate in the parish of St. Aubyn, Devonport, Plymouth, from 1890 to 1892, when he moved to serve St. Mary’s parish church, Kentisbeare, near Cullompton in mid-Devon, where he died in 1895. Sources: Dr. David Wykes, The Dr. Williams Library, Gordon Square, London (with thanks), and the Library’s Surman Index, available on line at: http://surman.english.qmul.ac.uk/; 1851 UK Census; White’s Directory of Leicestershire; E.M. Drew, 1952. Those Taking Part, 1802 – 1952: a brief history of Bond Street Congregational Church, Leicester (Leicester).